April 2. 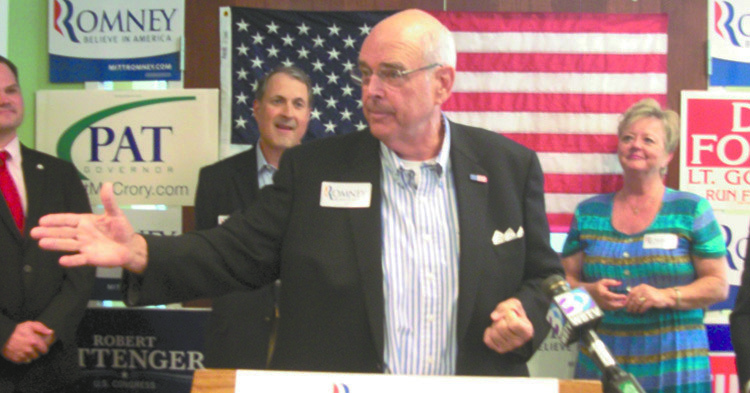 NC Republican Party Chairman and Concord resident Robin Hayes, 73, is among four people named in a federal criminal indictment unsealed today in the Western District of North Carolina. Hayes is a member of the Cannon textile family in Concord and a former member of the U.S. House of Representatives. On or about Aug. 28, 2018, FBI agents interviewed Hayes about his involvement with and knowledge of the alleged improper campaign contributions. During the interview, Hayes allegedly lied to FBI agents about directing funds, at Lindberg’s request, from Lindberg’s campaign contribution to the North Carolina state political party to the Commissioner’s re-election campaign; about having any discussions with the Commissioner about Lindberg or Gray; and about discussing with the Commissioner personnel issues related to the Commissioner’s office. OpenSecrets.org listed Hayes’ personal wealth at more than $170 million back in 2007. Yesterday he announced he would not seek another term as GOP state leader. The indictment charges principals in a multinational investment company, a consultant and two state political leaders with public corruption and bribery. The matter has to do with their alleged participation in a bribery scheme involving independent expenditure accounts and improper campaign contributions. Hayes is also charged with three counts of making false statements to the FBI. The defendants made their initial appearances today before U.S. Magistrate Judge David C. Keesler in federal court in Charlotte. Officials credited voluntary reporting by the North Carolina Commissioner of Insurance for helping uncover the alleged scheme to violate our federal public corruption laws. “These men crossed the line from fundraising to felonies when they devised a plan to use their connections to a political party to attempt to influence the operations and policies of the North Carolina Department of Insurance,” said Special Agent in Charge Strong. The criminal indictment alleges that in January 2018, the elected Commissioner of Insurance (Commissioner) of the North Carolina Department of Insurance (NCDOI) reported concerns to federal law enforcement about political contributions and other requests made by Lindberg and Gray, and agreed to cooperate with the federal investigation that was initiated. According to allegations in the indictment, from April 2017 to August 2018, Lindberg, Gray, Palermo and Hayes devised a scheme to defraud and deprive the citizens of North Carolina of the honest services of the Commissioner, an elected State official, through bribery. As alleged in the indictment, the defendants engaged in a bribery scheme involving independent expenditure accounts and improper campaign contributions, for the purpose of causing the Commissioner to take official action favorable to Lindberg’s company, GBIG. The indictment alleges the defendants gave, offered, and promised the Commissioner millions of dollars in campaign contributions and other things of value, in exchange for the removal of NCDOI’s Senior Deputy Commissioner, who was responsible for overseeing regulation and the periodic examination of GBIG. Lindberg, Gray, Palermo and the Commissioner held numerous in-person meetings at different locations, and with Hayes, to discuss Lindberg’s request for the personnel change in exchange for millions of dollars, and to devise a plan on how to funnel campaign contributions to the Commissioner anonymously, according to the indictment. In order to conceal the bribery scheme, Palermo allegedly set up, at the direction of Lindberg, two corporate entities to form an independent expenditure committee with the purpose of supporting the Commissioner’s re-election campaign, and funded the entities with $1.5 million as promised to the Commissioner. Also, at Lindberg and Gray’s direction, Hayes allegedly caused the transfer of $250,000 from monies Lindberg had previously contributed to a North Carolina state party of which Hayes was Chairman, to the Commissioner’s re-election campaign. Assistant Attorney General Brian A. Benczkowski of the Justice Department’s Criminal Division, U.S. Attorney Andrew Murray for the Western District of North Carolina and Special Agent in Charge John A. Strong of the FBI Charlotte Field Office, made the announcement. Trial Attorney James C. Mann of the Criminal Division’s Public Integrity Section and Assistant U.S. Attorneys William Stetzer and Dana Washington of the U.S. Attorney’s Office in Charlotte are prosecuting the case.